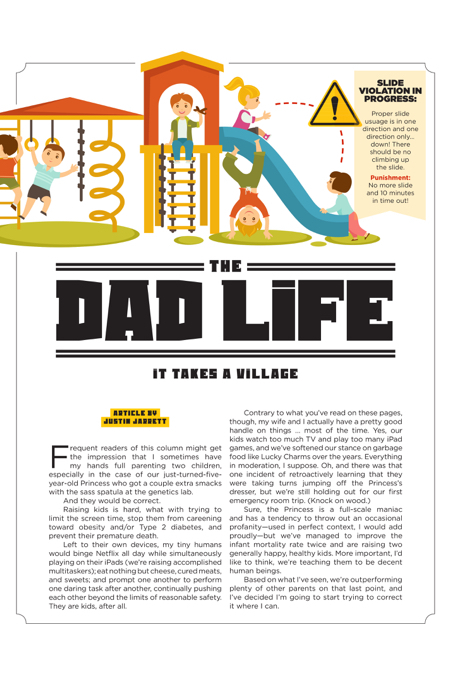 Frequent readers of this column might get the impression that I sometimes have my hands full parenting two children, especially in the case of our just-turned-five-year-old Princess who got a couple extra smacks with the sass spatula at the genetics lab. Raising kids is hard, what with trying to limit the screen time, stop them from careening toward obesity and/or Type 2 diabetes, and prevent their premature death. Left to their own devices, my tiny humans would binge Netflix all day while simultaneously playing on their iPads (we’re raising accomplished multitaskers); eat nothing but cheese, cured meats, and sweets; and prompt one another to perform one daring task after another, continually pushing each other beyond the limits of reasonable safety. They are kids, after all. Sure, the Princess is a full-scale maniac and has a tendency to throw out an occasional profanity—used in perfect context, I would add proudly—but we’ve managed to improve the infant mortality rate twice and are raising two generally happy, healthy kids. More important, I’d like to think, we’re teaching them to be decent human beings. Based on what I’ve seen, we’re outperforming plenty of other parents on that last point, and I’ve decided I’m going to start trying to correct it where I can. Look, I’m not going to slap a can of Mountain Dew out of your sugar-riddled four-year-old’s hands or cut off your sticky toddler after three Ring Pops when I’m working the concessions stand at the ballpark. The sugar rush and rotten teeth are your problem, not mine. But if your kids are violating reasonable social norms and you aren’t around to put them in their place, I’ll happily step in. I will do my best to remove your kid from a dangerous situation—“That kid is BACK on the ESCALATOR,” for my fellow Kevin Smith fans—with a gentle, “Hey buddy, you probably better get off of there,” and I certainly will shut down dangerous play that puts other kids in harm’s way, especially if they’re mine. I used to bite my tongue about kids climbing up the playground slide while my rule-following children sat at the top, paralyzed by indecision, but no more. If you won’t tell the kid slides are a one-way situation, I will. I’m not trying to cut short my lunch for a trip to the ER. Your kid thinks it’s cool to cut in line because Mommy and Daddy aren’t there to tell him no? Welp, I’m laying the smack down. Just ask the three kids who tried to pull that stunt on my watch at the hotel water slide the other day. I’m not a big fan of entitlement. They say it takes a village to raise a child, and I guess I’m teetering between being the village jester and the village curmudgeon. I’m usually the only adult in the middle of the kids—the all-time pitcher, the “big kid” playing Marco Polo, the “fun” dad—but that also puts me in a position to be the village sheriff from time to time, and I will carry out my duty to the village. Ultimately, it’s kind of a case of “if you see something, say something,” and I do. I expect other parents to do the same if my kids are out of control when beyond my gaze. If I teach my kids nothing else, I want them to value fairness and equality and care for the well-being of others … at least more than they care about their own when they’re jumping off the dresser. Just found your work, and LOVE it. I have 8 grandkids, so I pass these on to my kids.